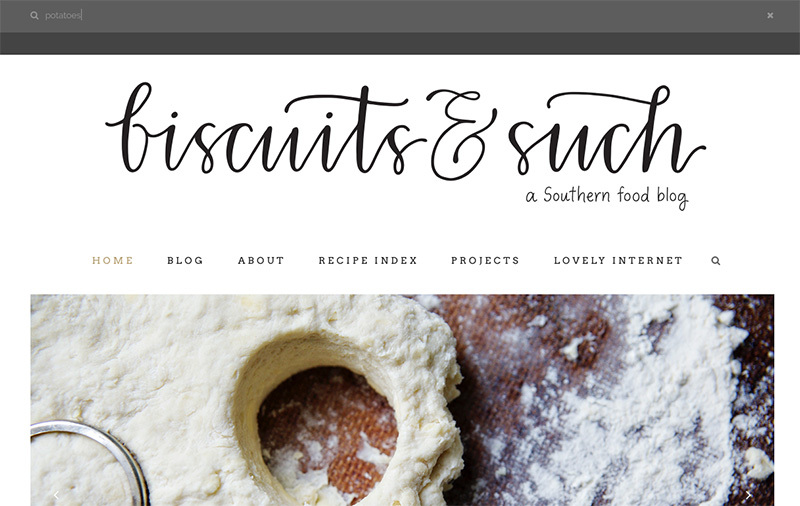 After many late nights of screaming at my computer I am proud and excited to introduce the new Biscuits and Such! It was a huge overhaul of the whole site and I’m both very happy with how it looks and completely terrified by the change. So you know, progress as usual! 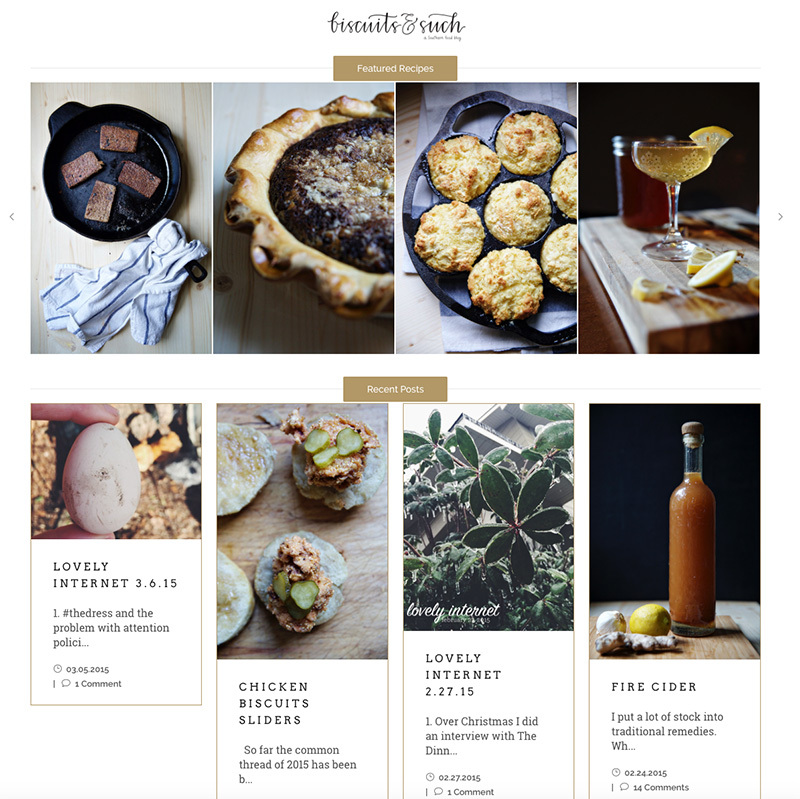 The biggest change is that the front page is no longer just the blog feed, but instead a collection of featured posts and recipes. You’ll find a scrolling carousel of ten of my favorite recent recipes (click the photo to see the recipe in full!) and the four most recent blog posts. 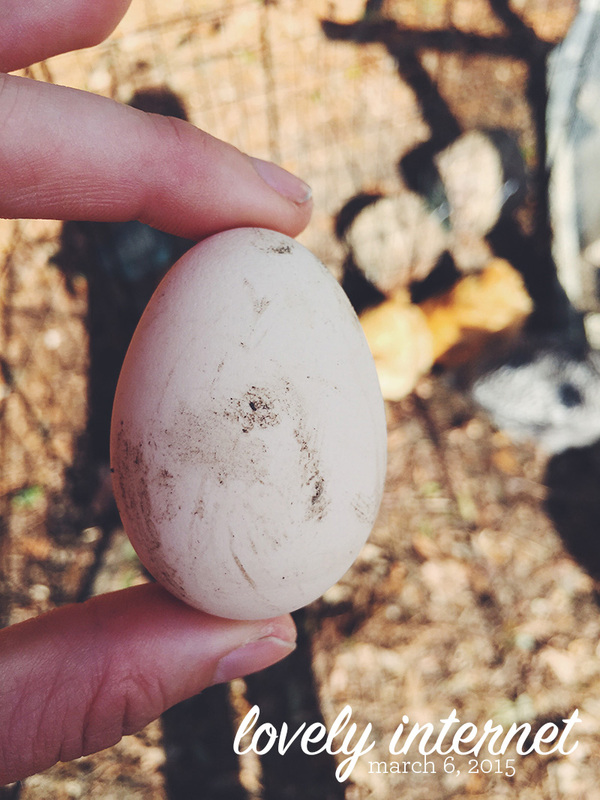 Want to see more of the blog? 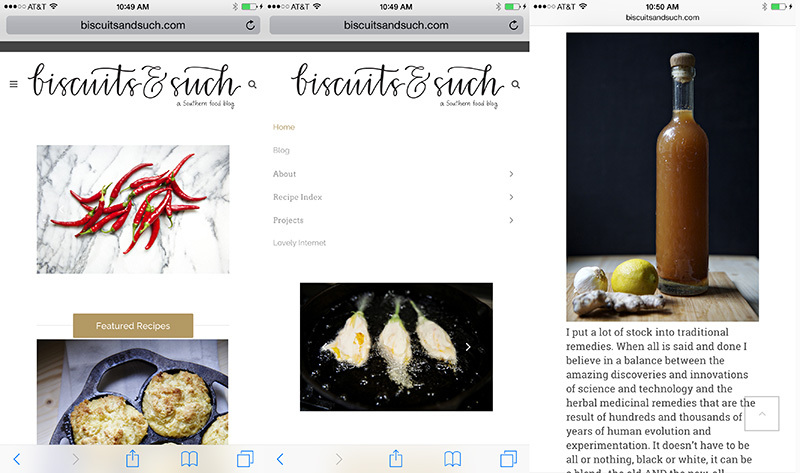 Just click “More Blog Posts” to see our blog page! 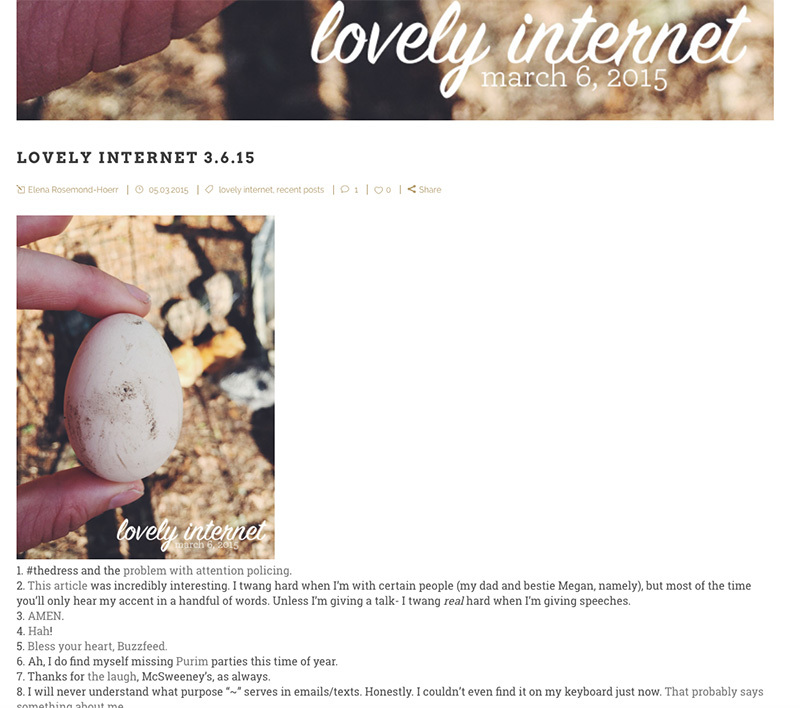 Speaking of the blog page! 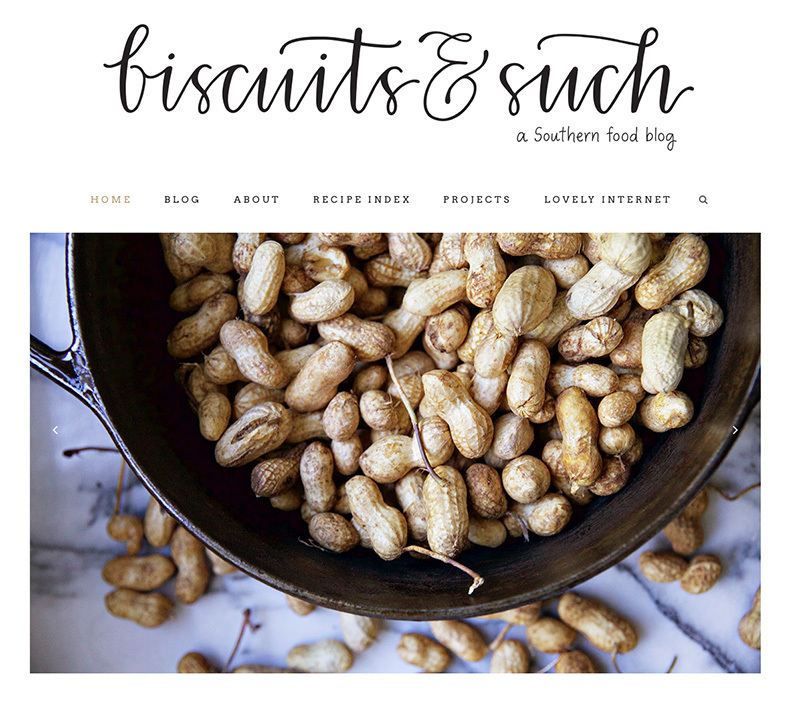 Click on the “Blog” link in the menu and you’ll see everything ever posted on B&S, three posts at a time. If you’re looking for something a little more specific, I think you’ll like the new recipe index. 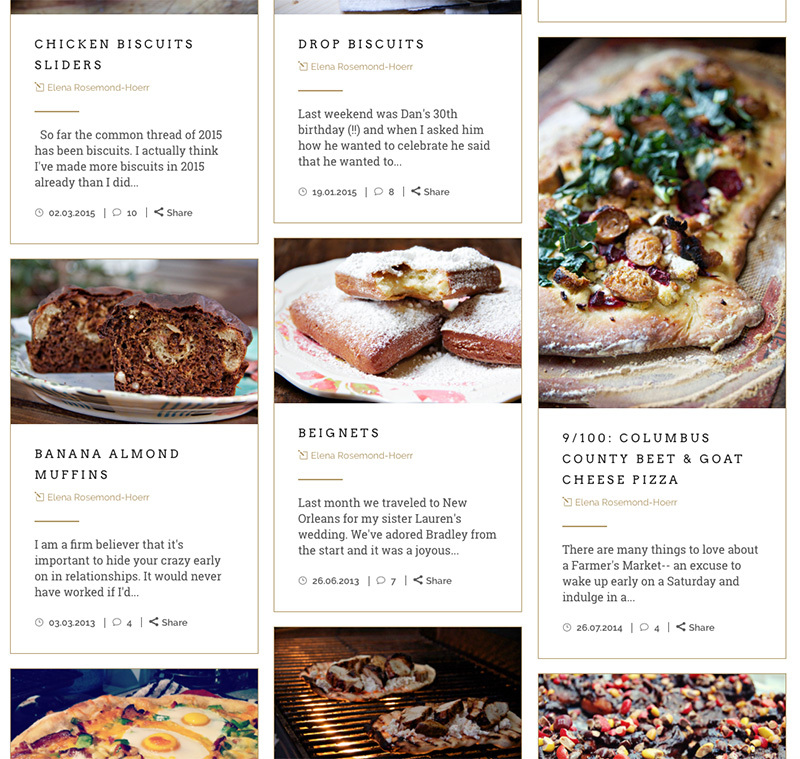 From main menu you can scroll through our recipes by category. You’ll see all the posts, starting with the most recent, in an image based format. 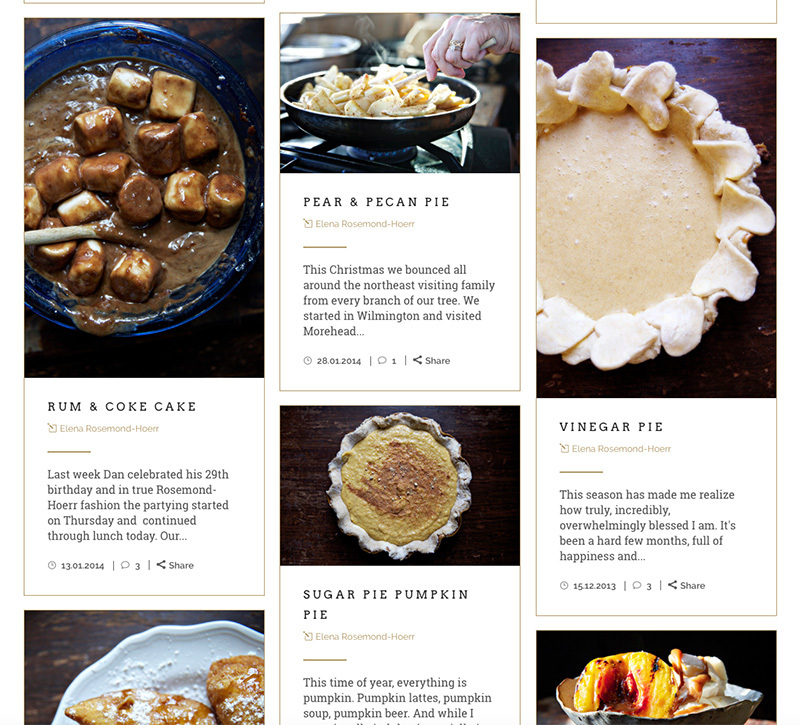 I can’t get over how awesome this looks, it’s so much fun to scroll through all the recipes and see over six years worth of recipes. Know exactly what you want? There’s a search! Click on the magnifying glass on the right side of the menu and a search bar pops up at the top. No matter what page you’re on you can pull up the search bar and search to your heart’s desire. Ultimately the reason I decided to overhaul the site is to make it more responsive, something that is a priority as use of mobile devices to access sites of all kind becomes more common. So no matter whether you’re accessing B&S on your computer, tablet, or phone, it will look beautiful. I am so happy with how it looks, and the feedback has been really wonderful and incredibly supportive. I would love to hear from YOU about what you think of the new design, and please know that I am happy to answer any questions you may have about navigating it. And I’m sure there are still some glitches, so if you find anything funky, let me know. And, as always, thank you for reading and loving and sharing B&S. The past six years of writing this site have been life changing, and I so appreciate the support of all of the people who read this site and make it worth it. 1. #thedress and the problem with attention policing. 2. This article was incredibly interesting. I twang hard when I’m with certain people (my dad and bestie Megan, namely), but most of the time you’ll only hear my accent in a handful of words. Unless I’m giving a talk- I twang real hard when I’m giving speeches. 5. Bless your heart, Buzzfeed. 6. Ah, I do find myself missing Purim parties this time of year. 7. Thanks for the laugh, McSweeney’s, as always. 8. I will never understand what purpose “~” serves in emails/texts. Honestly. I couldn’t even find it on my keyboard just now. That probably says something about me. 9. This was just what I needed to read this week. 10. On Saturday my friend Oren passed away. I wrote some things when I heard the news, and in the days since many of his fellow dad bloggers have written beautiful and moving tributes. Oren was one of the most genuine people I’ve ever met, which explains why he’s made such a deep impact on so many lives. His approach to life, parenting, writing, and living were an inspiration, and we’re all better for having had him as a part of our experience on this Earth. So far the common thread of 2015 has been biscuits. I actually think I’ve made more biscuits in 2015 already than I did in all of 2014. I’ve been churning them out, dude. It all started with the biscuit-palooza that was Dan’s birthday weekend with our college friends. A few weeks later for Dan’s birthday party I decided I wanted to make one-bite fried chicken biscuits (self five there). Then this past weekend, for my mom’s going away party (she’ll be spending the next year in South East Asia and the South Pacific) my brother Reid and I made country ham biscuit sliders. I’m on a roll (a biscuit?) and I have no complaints. 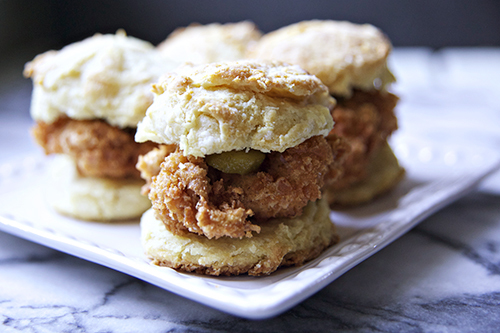 These chicken biscuit sliders were a huge hit, a delicious combination of fried chicken bites, buttery and flakey biscuits, dill pickle slices, and a sweet and spicy jalapeño honey. They’ll be back on the menu before too long. The night before you’d like to make these sliders cube your chicken into 24 bite size pieces. Combine in a bag with buttermilk, 1 tbsp red pepper flakes, 1 tbsp cayenne, and 1 tbsp salt. Refrigerate overnight. Set out three bowls for yourself and heat the oil in a skillet or a deep fryer. Oil should be 350-375F. In the first bowl combine 1 cup of flour with the garlic powder. In the second bowl whisk together your eggs with the apple cider vinegar. In the third bowl combine the remaining flour, bread crumbs, grits, and spices. Once your oil is hot take your chicken, two or three pieces at a time, from the buttermilk and shake excess buttermilk off. Dredge in flour mixture, then in eggs, and then in flour and breadcrumb. Make sure the chicken is completely coated in the third mixture and then drop into the oil. Fry for 3-5 minutes, turning as necessary, until golden brown and crisp. Transfer onto a rack to cool. Repeat until all of your chicken is fried. Heat oven to 400F. Mix together dry ingredients. Cube butter and work in with your hands, breaking the butter up into small pieces and mixing in with the dry ingredients, until the texture resembles cornmeal. Stir in the buttermilk. Transfer to a floured surface and press into a rectangle. Fold on itself and pat into a rectangle. Repeat three or four times, finishing with a large rectangle of dough that is 1″ thick. Use a small biscuit cutter to cut into 1″ rounds or slice with a knife into 1″ squares. Place on a baking sheet and brush the top of each biscuit with melted butter. Bake for 12-15 minutes or until golden brown. and baked through. 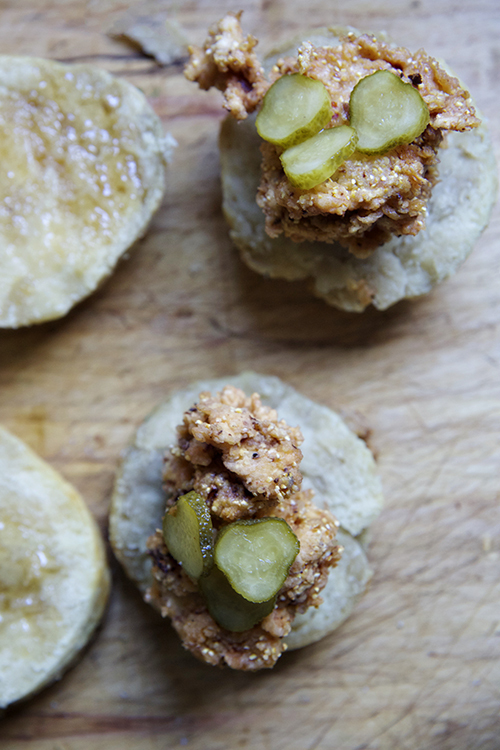 While your biscuits are baking, slice the pickles. Halve biscuits and smear generously with honey. 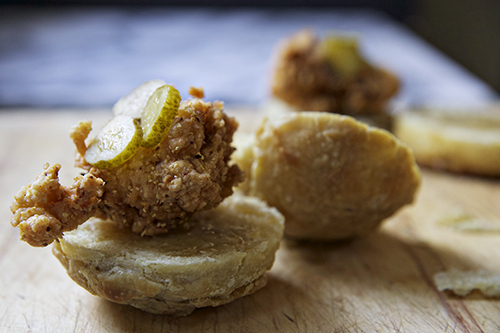 Place a fried chicken bite and a pickle slice on each biscuit and serve hot.